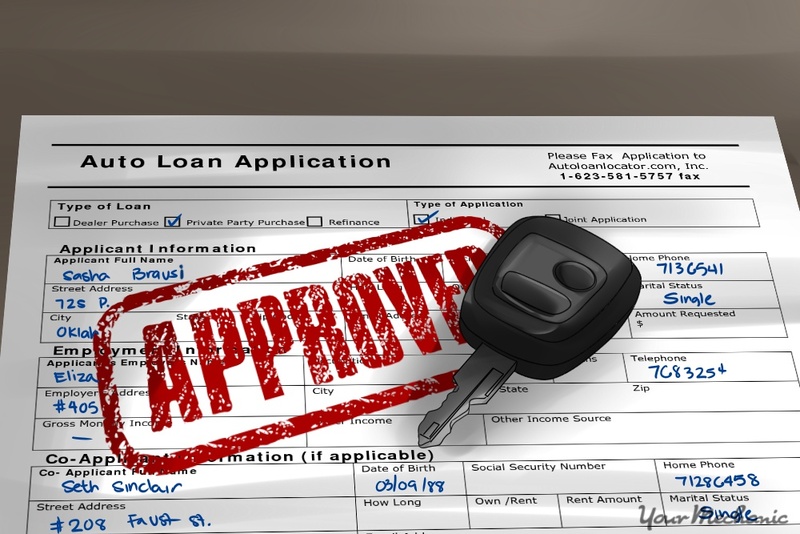 Taking out a car loan is one of the most common ways to finance purchasing a car. This is especially true if you are buying a new car, which usually costs too much to pay for in cash. Buyers most often use the aid of a car loan to cover the higher cost of a new car. A part of this higher cost are the finance charges that loan grantors charge loan applicants for their service and time. You have basically two ways to figure out the finance charges you have to pay for a car loan, on a monthly basis or over the lifetime of the loan. Step 1: Use a computer or do it yourself. The first thing you have to determine is whether you want to calculate the finance charges yourself or use an online calculating tool. Online calculators offer a precise way to determine exactly what you will end up owing on a car loan, including monthly payments. You can find a variety of tool online at various sites, such as Online Loan Calculator.org, Cars.com, and calculators at various bank sites, including Bank of America. Tip: By calculating the cost of a new car loan yourself, with all of its associated finance charges and fees, you can ensure that you are getting the best deal possible. When applying for a new car loan, look for low Annual Percentage Ratings, or APR. Most often, with good credit, car buyers can get 0-percent APR loans, especially if they offer a large down payment on the vehicle. Step 2: Fill in the fields. First, fill in the various fields on the online calculator, such as the vehicle purchase price, any down payment you expect to pay for the vehicle, the trade-in value of any vehicle you plan to trade in, interest rate, length of the loan, and sales tax percentage for your state. Tip: Before approaching a dealer about buying a car, first learn what your credit rating is. This gives you an idea of what you qualify for and can afford. Typically, the worse your credit is, the higher APR you must pay, which increases your finance charges over the life of the loan. You can find your credit score using Experian or Transunion. Step 3: Find your results. After you enter your information, press calculate. A good calculator should tell you what you can expect to pay each month, the number of payments, the total amount you can expect to pay, the total interest paid, and the payoff date. 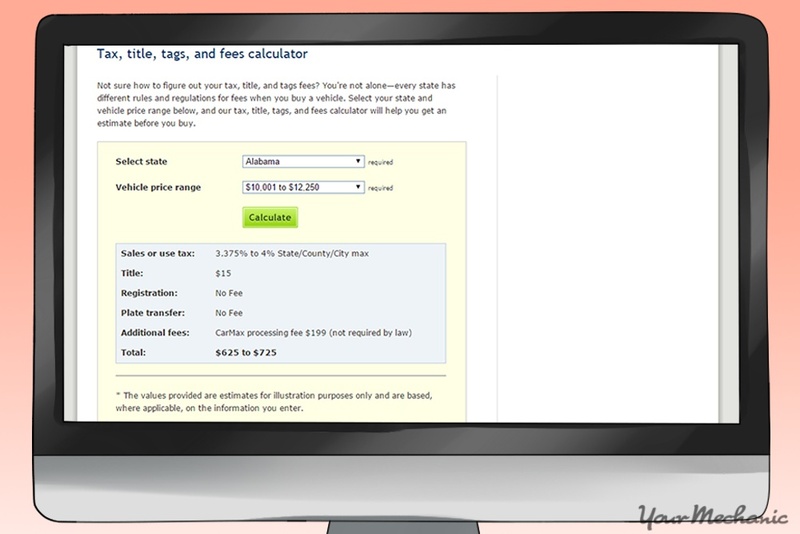 Some calculators break it down even further and show you how much you can expect to pay on a yearly basis. Tip: When calculating the cost of your new car loan, you often need to determine the percent of sales tax that you can expect to pay, as well as how much the title, tags, and other fees will cost in your state. You can determine this by visiting a site such as Carmax, where you can input your state and the amount you expect to pay to get the amount you should end up paying. Knowing how much you owe on a new car loan allows you to know when you should have your loan paid off, as well as to better budget for other expenses. By figuring out how much in finance charges you can expect to pay over the life of the new car loan, you can determine if a new car fits within your long-term budget goals. Some car buyers prefer to calculate the financial charges themselves instead of using an online calculator. For example, a 3 year (36 month) loan of $15,000 at 7% interest works out to a monthly payment of $463.16. To obtain the "principal times the interest rate due per payment" part of the equation, convert the APR to a decimal by dividing it by 100. Take the number obtained and divide it by 12 to get the monthly percentage rate as a decimal. Then, multiply the principal by the monthly percentage rate. 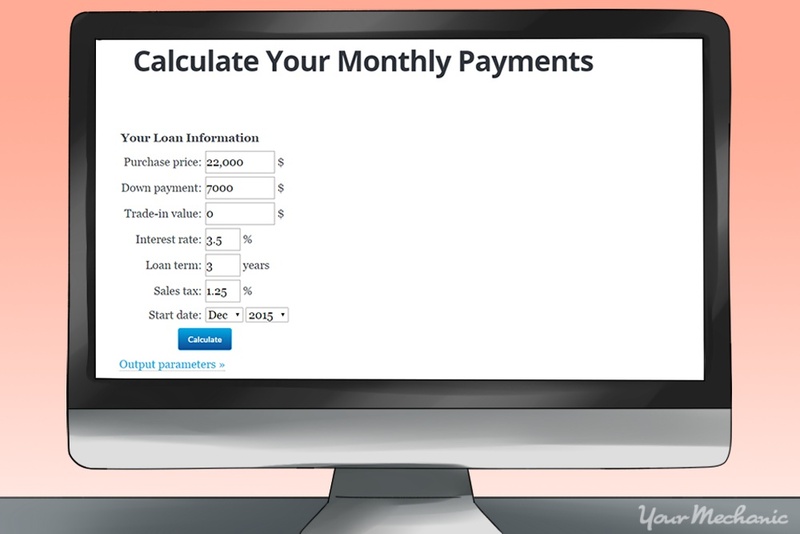 To calculate the other half of the equation, enter 1 + the interest rate due per payment, hitting the button x^y on the calculator and entering the number of payments. Next you would subtract the figure obtained from 1. Divide the first figure obtained by the second figure to get your monthly payment. Step 2: Determine your total finance charges. To determine how much you can expect to pay in finance charges over the life of the loan, multiply the Monthly Payment Amount by the Number of Payments, minus the Amount Borrowed. This should give you the Total Amount of Finance Charges that you can expect to pay. Tip: Make sure to check your work by dividing the amount you got by the number of payments and comparing that to the total finance charges per month. In addition to knowing what you owe on a new car loan overall, having an idea how much you can expect to spend on a monthly basis is helpful as well. Knowing what you owe on a monthly basis allows you to better prepare a monthly budget. 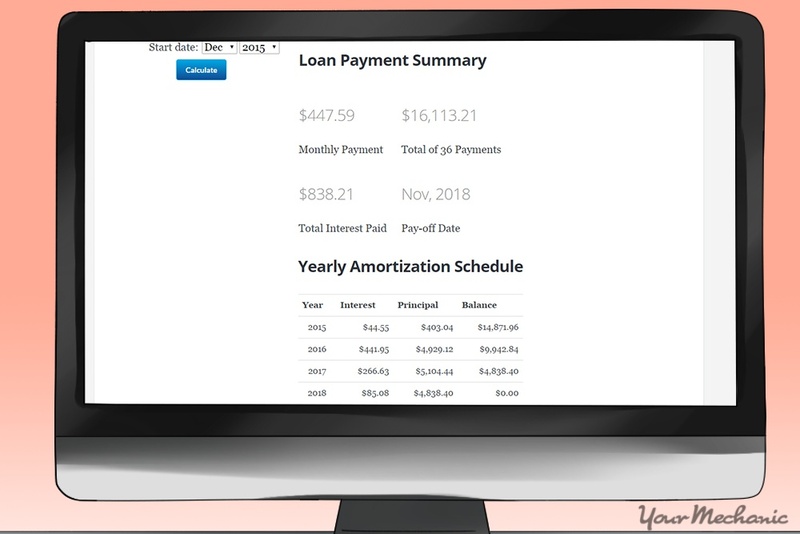 To figure out the "principal times the interest rate due per payment" part of the equation, you can start by converting the APR to a decimal by dividing it by 100. Then you should take that number and divide it by 12 to convert the monthly percentage rate into a decimal. Then, it is just a matter of multiplying the principal by the monthly percentage rate. Calculate the other half of the equation by adding 1 to the the interest rate due per payment. Next, hit the x^y button on the scientific calculator and enter the number of payments. Then, subtract the figure obtained from the number 1. Divide the first figure obtained by the second figure to get your total monthly payment, including finance charges. Next, figure out how much principal you have to pay monthly. This is as simple as dividing the total amount of the loan by the number of payments. Step 2: Figure out the monthly principle. Next, you need to figure out how much principal paid each month. To get the principal paid each month, divide the principal amount by the expected payments in months. Step 3: Determine your monthly finance charges. Last of all, determine the monthly finance charges you can expect to pay. This involves multiplying your monthly payment by the number of payments. Subtract the principle from the number gained to get the total amount you owe each month. Tip: You can check your work by dividing the total amount of finance charges by the number of payments. This should give you a monthly amount that matches the monthly finance charges you calculated earlier. Always make sure that you check your financial situation by calculating all the associated costs before taking out a loan to purchase a new car. Making sure you can afford a car over the long run can help you avoid troublesome repossessions by the lender. It also pays to maintain your vehicle over its lifetime. Call upon one of our expert mechanics to advise you on the best course of action when maintaining your vehicle and to help you keep your car in great running condition. Q: the car is loud when I test drived it. When I accelerate it almost choked but overall runs fine, may just be muffler?